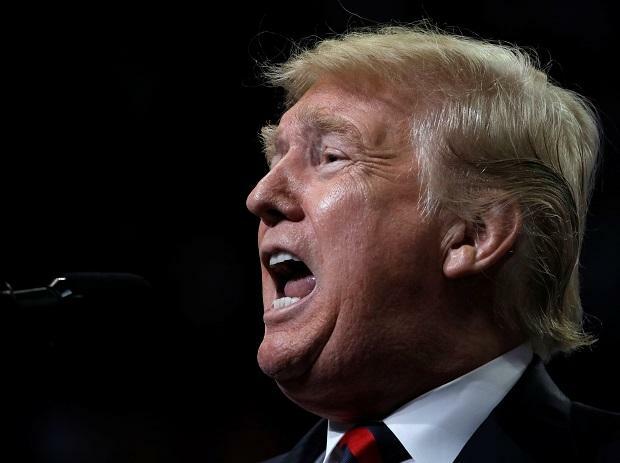 US President Donald Trump's post-election news conference at the White House saw him getting involved in angry exchanges with reporters a number of times as he termed one "rude and terrible" person and accused another of asking "racist" questions. During his around one-and-a-half-hour press conference on Wednesday, he walked away from the microphone a few times refusing to take questions from reporters, who, he said, were speaking out of turn. "Very hostile. It is such a hostile media. It's so sad," Trump said. To a CNN reporter's question on a migrant caravan from Central America moving towards the United States, many members of whom were termed "criminals" by Trump, the visibly upset president said, "I think you should let me run the country, you run CNN." When the CNN reporter refused to hand over the microphone to a White House staffer, as Trump had called another journalist to ask question, the president said, "That's enough. Put down the mic." When the reporter asked whether Trump was worried about indictments coming down in this investigation, he said, "I tell you what, CNN should be ashamed of itself having you working for them. You are a rude, terrible person, You shouldn't be working for CNN." "I think, that's unfair," the CNN journalist said. But Trump continued, "You're a very rude person. The way you treat (White House Press Secretary) Sarah Huckabee Sanders is horrible and the way you treat other people are horrible. You shouldn't treat people that way." When an NBC News reporter came to his fellow journalist's defense, the president said, "When you report fake news, which CNN does a lot, you are the enemy of the people." Trump also accused a black reporter of asking a "racist question" after she sought to know him what he thought of some people's opinions that the Republican party supports white nationalists. "I don't believe it...That's such a racist question. Honestly, I know you have it written down, that's a racist question...I don't use racist remarks," he said. Trump got upset when another reporter started asking questions without being called for. He accused another female journalist of rudely interrupting another reporter who was given a chance to ask questions. Later, the CNN, in a statement, said Trump's attack on the press has gone too far. "The President's ongoing attacks on the press has gone too far. They are not only dangerous, they are disturbingly un-American. While President Trump has made it clear he does not respect a free press, he has a sworn obligation to protect it," the CNN said. "A free press is vital to democracy, and we stand behind Jim Acosta and his fellow journalists everywhere," he channel said.